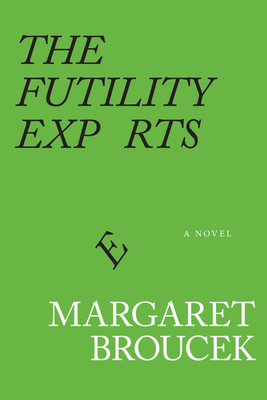 Margaret Broucek's debut novel, The Futility Experts, is a wickedly funny examination of how not to age gracefully. Feeling trapped in a stagnant marriage, working a dead-end job, and desperately coveting the last good parking spot, Tim Turner decides to do what any middle-aged man not in his right mind would do; reinvent himself online as a 21-year-old marine . At the same time, Davis Beardsley, a professor of zoology obsessed with imaginary creatures, watches his chances for tenure circle the drain when a new department head takes a dim view of his teaching methods. Delivered with deadpan wit and keen insight, not to mention a decrepit Sasquatch, a Romanian adoptee hell-bent on destruction, and a trio of incontinent lapdogs, The Futility Experts will appeal to fans of Jami Attenberg, Gary Schteyngart, and anyone who likes their comedy with a little chaos. Margaret Broucek is a filmmaker and playwright whose works have appeared Off-Broadway and in festivals in the U.S. and Europe. She has had short stories published in the anthologies Sudden Fiction, Continued, Best of TriQuarterly, and also in Alaska Quarterly Review. She holds an MFA in Writing from Sarah Lawrence College.